Today is Katie's graduation party. Since the sun is shining, Holly and Bob will be able to grill as planned. They were thinking of cooking some chicken, as well as hamburgs and hotdogs. We just got back from Bonefish Grill. May never need to eat again. Oh Trixxee, I am so jealous! We LOVE that place!!! Hope you are having fun, Maryann!! Jean, it couldn't be any more boring than what we have been having lately! Tonight, I put a whole split chicken in a pan over some little red potatoes and onions on the grill. After half cooking time, I added fresh green beans, broccoli/cauliflower and baby Bella mushrooms. We worked this afternoon and my plans for an early afternoon disappeared, so dinner isn't quite ready. But it sure is smelling good! Thanks Daphne, we had a great time. After dinner, cake, and gifts for Katie, I brought in a box for Abby that Jean sent. Honestly, I don't know when I have ever seen her so excited, and Holly was flabbergasted! 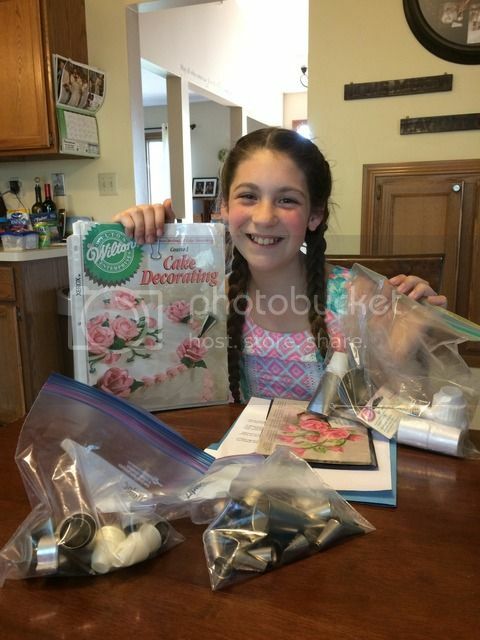 It turns out Abby's other grandmom has done some cake decorating, so she was very excited to go through all the individual pieces AND all the class material with us. It will give her something fun to do with Abby when she comes to visit. Jean, Abby and I thank you so much for your generous gift. You all are so welcome and I'm so glad my 'treasures' have a home that will have fun with them. Hope we see some great decorations in their future. I have leftover Mexican stew which is really thick, so I think I'll morph it into a taco salad with all the goodies and tortilla bowls. We are going over to Holly's for party l/os, then to Katie's actual graduation ceremony. She had to have the party over the weekend when everyone could make it. We won't be eating much more than a snack before the ceremony because the school puts on a reception after the ceremony. Tomorrow, I have to get back on low carb again! Has the weather cooperated at all with all the celebrations?? But, what the heck - great weekend for you all, anyway. We have had so much rain in the last few weeks it has given us some idea of what it must be like to live in the Pacific Northwest. Everything sure is green though! Yesterday was beautiful for the party and so far today has been great, too. Of course I can't go a day without cooking something! So, I made a pot of cream of cauliflower soup to get me back on track tomorrow. I find that if I have something hot or at least warm for lunch, it seems to be more satisfying than something cold. Weird, huh?